OSMF still remains enigmatic as the multifactorial model for pathogenesis such as consumption of chilies, areca nut, iron and nutritional deficiencies, tobacco, lime, genetic abnormalities, altered salivary constituents, herpes simplex virus, human papilloma virus, and autoimmunity has been postulated to have their direct and indirect effects in OSMF. Most important risk factor is chewing betel quid and this has been supported by epidemiological, case control, animal trial and tissue culture studies as well. Also, it has been a part of religious, social, and cultural rituals. There is no definitive treatment for OSMF. Owing to its multifactorial etiology and pathogenesis, various modalities are tried over years, but no single drug has provided complete relief from symptoms of OSMF. Evaluation of the merits and disadvantages of individual items in management is not possible owing to the use of combined treatment protocols, which is inevitable at present because of the empirical nature of each approach. Many methods use physiotherapy as an adjuvant therapy. Therapeutic ultrasound has been used extensively in physical medicine with considerable success. The objectives of ultrasound treatment are to accelerate healing, increase the extensibility of collagen fibers, and provide pain relief. Kneading is an effective form of massage therapy in improving the elasticity of fibrous tissues and mobilizing scar tissues., The gentle soft tissue manipulation is broadly used in physiotherapy for improving their extensibility. The effect of ultrasound has been studied in OSMF as an adjuvant to the conventional modalities. In literature, there are very few studies signifying the role of therapeutic ultrasound in OSMF and this still remains a hidden field which needs to be explored further. Hence, this study is designed to evaluate the adjuvant effects of therapeutic ultrasound and physiotherapy in OSMF patients. The pathogenesis complexity of the disease process dictates the need for multimodality therapy. This study was conducted on OSMF patients visiting the outpatient department of Oral Medicine and Radiology, ITS-CDSR, Muradnagar, Ghaziabad, in collaboration with Physiotherapy Department ITS CDSR. Thirty patients (between age group 20 and 40 years) with clinically diagnosed oral submucous fibrosis and fulfilling the inclusion criteria of Maximal Mouth Opening <30mm accompanied with burning sensation on eating spicy foods were enrolled in the study. Presence of any other disease that mimics OSMF such as systemic sclerosis, tetany, patients with any history of radiotherapy, history of medicinal or surgical treatment for OSMF, and presence of other systemic disease (screened by medical history/questionnaire) were excluded from the study. The institutional ethical committee clearance was obtained before start of the study. A written informed consent was taken from all subject included in this study. According to the software-generated sequence, the patients selected for study after carrying exclusion and inclusion criteria were allocated into one of the groups A and B. Group B consists of 15 OSMF patients who were administeredI/L injection of triamcinolone acetonide + I/L injection of hyalase (biweekly) + lycopene 12 mg/day for 3 months + therapeutic ultrasound and soft tissue mobilization. Areas for local injection submucosal: buccal mucosa, outer aspects of soft palate, pterygomandibularraphae, and circumoral bands (if any). Inj. Hyalase- 1,500 I.U. dissolved in 2 c.c. of 2% lignocaine. After the I/Linjection, patients of group B were subjected tosoft tissue mobilization and ultrasound therapy: ultrasound and physiotherapy sittings were scheduled continuously for 15 consecutive days with a day off each week. During the study, all the patients were treated with the same calibrated ultrasound equipment [Figure 1]. Time 6 min using a sound head back and forth in the template at a speed of ~4cm/s to each side involved over the area of fibrosis. Gradual mouth stretching by placing the left thumb over the upper incisor and right index finger over the lower incisor and maintaining it for 5 s- 10 repetition. In total, 30 patients diagnosed clinically and histopathologically with OSMF, fulfilling the inclusion criteria of the study, were randomly allocated in group A and group B with 15 patients in each group. Statistical analysis was done using SPSS Version 19 and for intraobserver variability independent t-test was applied. Mouth opening ranged between 7 and 30 mm. The mean mouth opening in group A was 19.80 mm, whereas in group 2, it was 19.25 mm. Tongue protrusion ranged between 15 and 40 mm. The mean tongue protrusion in group A was 24.55 mm, whereas in group 2, it was 25.50 mm. Cheek flexibility on right and left side ranged between 1 and 1.3 cm. The mean cheek flexibility in group A was 1.033 mm and in group B was 1.053 mm. It was observed that the frequency of appearance of fibrous bands was more over retromolarraphae and mid-buccal mucosa followed by anterior buccal mucosa. Out of 30 patients, 28 (93.24%) reported burning sensation on consuming hot and spicy food. Only two patients reported with no burning sensation. Mean of burning sensation in group A was 7.2 on VAS scale. Mean of burning sensation in group B was 8.6. The three readings on mouth opening in group A and group B do not showany significant difference, from P value, showing that the results of mouth opening in each group are independent of each other. On the other hand, the difference at baseline to 15 days, baseline to 3 months, and 15 days to 3 months shows that the difference is statistically significant at 0.05 levels. The difference also shows that the difference in mouth opening in group B is more than group A. The difference between mouth opening in 15 days to 3 months is not high suggestive that the maximum difference in mouth opening is achieved in first 15 days of treatment protocol as shown in [Table 1]. [Table 2] shows similar statistical details for tongue protrusion at baseline to 15 days and after 3months. The values are different than the mouth opening, but the pattern of the resultant was similar to mouth opening. At the end of 3 months, the difference between the two groups is minimal and statistically insignificant. The significant P value at baseline to 15 days is 0.002, whereas from 15 days to 3 months, it is 0.017. This shows that there is a significant difference, but the significance is less between 15 days and 3 months. [Table 3] shows the difference in the cheek flexibility using the same parameters of timing. The table shows a significant difference in the first 15 days and between 15 days and 3 months similar to tongue protrusion. The difference between baseline and 3 months is not significant, suggesting that after 3months, both the treatment show equal effectiveness. [Table 4] shows the difference in the burning sensation using the same parameters of timing. The difference between baseline and 3 months is not significant suggesting that after 3months both the treatment shows equal effectiveness. Overall, 30 patients in the study had blanching of buccal mucosa bilaterally, whereas only one reported with unilateral involvement, which shows the prevalence of bilateral blanching of buccal mucosa in OSMF patients. The mean mouth opening before giving any treatment in group A was 19.80 mm, whereas in group B, mean mouth opening was 19.25 mm. The improvement was analyzed and showed that after treatment, the difference in mouth opening in group B is more than in group A. On comparing, the improvement in mouth opening from baseline to 3 months and 15 days to 3 months is not high suggesting that the maximum difference in mouth opening is achieved during the first 15 days of treatment protocol. There was high significant improvement in mouth opening in first 15 days in group B as compared with group A [Figure 2] and [Figure 3], which was in accordance with studies done by Pooja et al. (2010), Vijaykumar (2013), Subramanium et al. (2014). This rapid improvement in group B in first 15 days is attributed to the therapeutic effect of ultrasound, which works on creating the extensibility of collagen fibers and to reduce inflammation, thereby promoting healing. Kneading and soft tissue mobilization is an effective form of massage therapy in improving the elasticity of fibrous tissues and mobilizing scar tissues, which increases the blood flow to the area, thus, holistically aiding in repair and regeneration of the tissue. The tongue protrusion showed significant improvement, but the pattern of the resultant was similar to mouth opening. The tongue protrusion improves predominantly in first 15 days. At the end of 3 months, the difference between the two groups is minimal and statistically insignificant. Additionally, the tongue exercises such as straight tongue stretch, side tongue stretch, up and down stretch, tongue sweep, and pushing the tongue against the inside of the cheek were done for coordinating and strengthening the muscle activity. Due to the force being continuously and broadly distributed, patients are able to exercise with minimal discomfort. Instructing tongue exercises regime helped in maintaining the post-therapeutic tongue protrusion. The cheek flexibility shows a significant difference in the first 15 days and between 15 days to 3 months, similar to the tongue protrusion. The difference between baseline and 3 months is not significant, suggesting that after 3 months, both the treatments show equal effectiveness. The mean improvement in burning sensation was better in group B as compared with group A. However, the difference is statistically not significant. This was similar to a study carried out by Kumar et al. (2007), which showed similar pattern of improvement. Result of the study after 2 years was same as attained after 3 months as we checked all the parameters whenever the patient comes for routine checkup as advised. There is a disadvantage of this ultrasound therapy as it presents a risk of periosteal burning/pain, since it causes differential heating at tissue interfaces. However, in the study, there were no reported cases of such side effects. In this study, both A and B groups were given lycopene and I/L injection (biweekly) for 3 months. Only the therapeutic ultrasound with soft tissue mobilization was used in group B. In both the groups, at 3 months, the results were almost same and there was no significant difference in all the variables. Like previous studies, the combination therapy and I/L injections have shown effective results, but rapid improvement in group B in the initial 15 days has been obtained by administrating therapeutic ultrasound as an adjuvant therapy.,, The rapid improvement helps in patient motivation and compliance for the treatment completion. Therapeutic effects obtained by ultrasonic energy are due to increased vascular and fluid circulation, increase in cell permeability, and increase in pain threshold and a break in pain cycle. The physiological effects of ultrasound may induce thermal and nonthermal physical effects in tissues. Thermal effects (continuous mode) are those that are due to heating and may include increased blood flow, reduction in muscle spasm, increased collagen fibers extensibility, and proinflammatory response. In the cases of OSMF, we want more of thermal effects, so continuous mode is advisable for treatment. Also, the ultrasound is a deep heating modality, wherein, at an intramuscular depth of 3 cm, a 10-min hot pack treatment yielded an increase of 0.8°C, whereas at the same depth, 1-MHz ultrasound has raised muscle temperature nearly 4°C in 10 min. At 1 cm below the fat surface, a 4-min warm whirlpool (40.6°C) raised the temperature 1.1°C. However, at the same depth, 3-MHz ultrasound raised the temperature 4°C in 4 min. 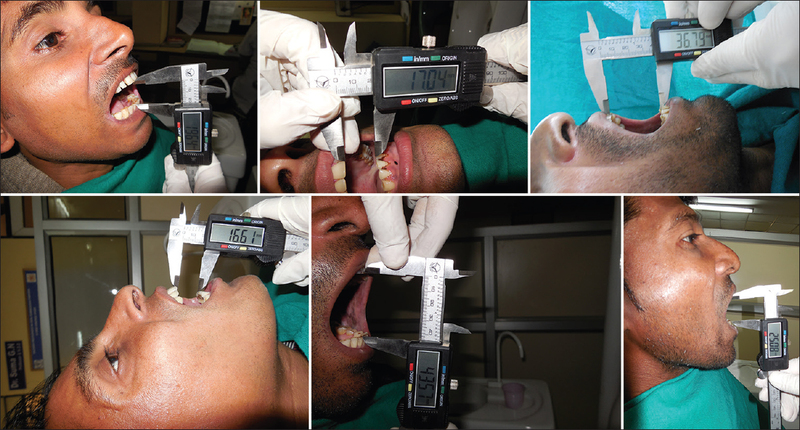 Collectively, with a cessation of the betel quid chewing habit, these treatment regimens combined with daily mouth opening exercises were found to be necessary to manage OSMF cases in early and advanced stages of progression. A multidisciplinary palliative care approach is the need of the hour for OSMF patients developing severe trismus refractory to conventional medical and surgical treatment. Therapeutic ultrasound proves to be an effective adjuvant along with combination therapy in patients of OSMF. The long-term effect with I/L injection and lycopene, which is current mode of treatment, should be continued. Therapeutic ultrasound when used as an adjuvant shows a significant improvement in the patients' condition with no reported side effects, hence, should be incorporated in the treatment protocol for patients with OSMF. Another study involving a larger sample size would be ideal and also staging of OSMF would have revealed better results. Pindborg JJ, Mehta FS, Gupta PC, Daftary DK. Prevalence of oral submucous fibrosis among 50,915 Indian villagers. Br J Cancer 1968;22:646-54. Kumar A, Bagewadi A, Keluskar V, Singh M. Efficacy of lycopene in the management of oral submucous fibrosis. Oral Surg Oral Med Oral Pathol Oral Radiol Endod 2007;103:207-13. James L, Shetty A, Rishi D, Abrahim M. Management of oral submucous fibrosis with injection of hyaluronidase and dexamethasone in grade III oral submucous fibrosis: A retrospective study. J Int Oral Health 2015;7:1-4. Vijaykumar M, Priya D. Physiotherapy for improving mouth opening and tongue protrusion in patients with oral submucous fibrosis (OSMF)-Case series. Int J Pharm Sci Health Care 2013;3:50-8. Bhardwaj R, Chaudhary K, Kaur S, Gupta R, Kamal R, Kumar M. Lycopene in oral health. Indian J Oral Sci 2013;4:125-9. Sunderraj S, Sharma R, Agarwal V, Narang P, Reddy YG, Sharma A. An in vivo study to determine the efficacy of lycopene as compared to multivitamin preparation in the treatment of oral submucous fibrosis. IJOMR 2012;24:190-3. Win PA and Win SS. Efficacy of lycopene in the treatment of oral submucous fibrosis. Mayanmar Dent J 2012;19:39-44. Manjunath K, Rajaram PC, Saraswathi TR, Sivapathasundharam B, Sabarinath B, Koteeswaran D, et al. Evaluation of oral submucous fibrosis using ultrasonographic technique: A new diagnostic tool. Indian J Dent Res 2011;22:530-6. Lai DR, Chen HR, Lin LM, Huang YL, Tsai CC. Clinical evaluation of different treatment methods for oral submucous fibrosis. A 10-year experience with 150 cases. J Oral Pathol Med 1995;24:402-6. Merchant AT, Haider SM, Fikree FF. Increased severity of oral submucous fibrosis in young Pakistani men. Br J Oral Maxillofac Surg 1997;35:284-7. Canniff JP, Harvey W, Harris M. Oral submucous fibrosis: Its pathogenesis and management. Br Dent J 1986;160:429-34. Panigrahi R, Maheshwari A. A prospective, randomized double blind study comparing intralesionaltriamcinolone acetonide and hyaluronidase combination versus triamcinolone acetonide alone in the treatment of oral submucosal fibrosis. J Pharm Biomed Sci 2014;4:365-70. Goswami R, Gangwani A, Bhatnagar S, Singh D. Comparative study of oral nutritional supplements vs intralesionaltriamcinolone and hyaluronidase in oral submucous fibrosis. Int J Med Res Rev 2014;2:114-8. Ghom AG, Gupta M, Doeghare A, Diwan R, Khandelwal A, Gandhi A. Comparison between efficacy of hydrocortisone/Hyaluronidase and Triamcinolone/Hyaluronidase in combination with lycopene/Pentoxifylline/Placebo oral supplementation in treatment of trismus in OSMF patients. Chhattisgarh J Health Sci 2013;1:9-11. Arora PK, Deshpande M. Effect of ultrasound and jaw opening exercise in cases of oral submucous fibrosis. IJPOT 2010;4:45-6. Subramaniam A, Subramaniam T, Agarwal N. Assessment of the effectiveness of antioxidant therapy (lycopene) and therapeutic ultrasound in the treatment of oral submucous fibrosis. Int J Pharm Ther 2014;5:344-50. Rubin D. Ultrasonic therapy-physiological basis and clinical application. Calif Med 1958;89:349-51. Mangal S, Niranjan HS. Efficacy of hydrocortisone acetate/hyaluronidase vs triamcinolone acetonide/hyaluronidase in the treatment of oral submucous Fibrosis. Indian J Med Res 2010;131:665-9. Galechar P, Soni N, Bhise AR. A comparative study of ultrasound and exercise versus placebo ultrasound and exercise in patient with oral submucous fibrosis. Ind J Phy Ther 2014;1:37-41.